THE GODFATHER sequel follows the Corleone family as we see how the family empire was built by young Don Vito Corleone (De Niro) and how Michael (Pacino) extends the family's influence into Nevada. Francis Ford Coppola (who also won the Oscar for direction). Robert De Niro / Oscared Supporting Actor! With Talia Shire, John Cazale, Lee Strasberg, Michael V. Gazzo, G.D. Spradlin, Abe Vigoda, Fay Spain, Mariana Hill, Joe Spinell, Harry Dean Stanton, Morgana King, and Danny Aiello. Francis Ford Coppola (1939 - ) American writer-director who has produced many of his films. Coppola's other works include: AMERICAN GRAFFITI, THE CONVERSATION, APOCALYPSE NOW, ONE FROM THE HEART, PEGGY SUE GOT MARRIED, GARDENS OF STONE, and DRACULA. Mario Puzzo and Francis Ford Coppola received the Screenplay (based on material from another medium) Oscar. While Dean Tavoularis, Angelo Graham, and George R. Nelson was awarded the Oscar for Art Direction/Set Decoration. Nino Rota and Carmine Coppola received the Music (Original Dramatic Score) Oscar. 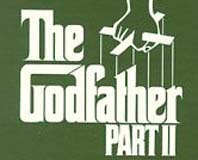 Another sequel GODFATHER 3 was made in 1990.